Print it out on cardstock, cut it out. Put painters tape on your bucket as wrinkle free as you can, use the cardstock cutout to trace onto the painters tape. Use an exacto blade to cut and remove the part of the stencil where you want your paint. Press all the remaining edges down firmly. Spray. Thanks again Sep, one last question: When painting the eyes they might run over some of my weathering spots, should I continue painting over it or sand it away for consistency? "Here's why you can't exterminate us, aruetii. We're not huddled in one place—we span the galaxy. We need no lords or leaders—so you can't destroy our command. We can live without technology—so we can fight with our bare hands. We have no species or bloodline—so we can rebuild our ranks with others who want to join us. We're more than just a people or an army, aruetii. We're a culture. We're an idea. And you can't kill ideas—but we certainly can kill you." I recommend either masking it with toothpaste or sanding after. Once the paint has dried for 2-3 hours, removed the toothpaste with a babywipe. Don't let it crytallize and dry hard. I have no idea how this happened. 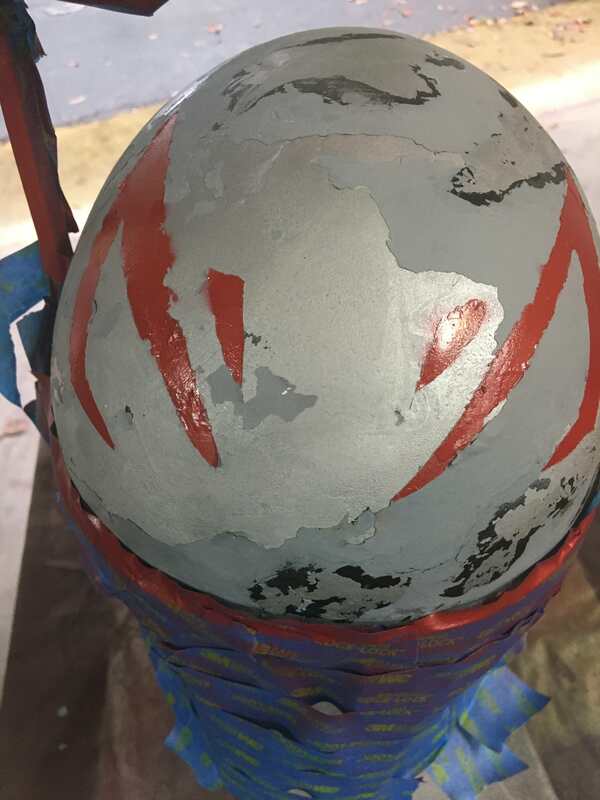 I cut out the sections of the tape, that took some paint off but not nearly enough for entire LAYERS to be peeled off when the tape was removed. I've done this amount of tape on the dome before so this is not something that's happened previously, it took of not only the grey top layer but the black under that too! 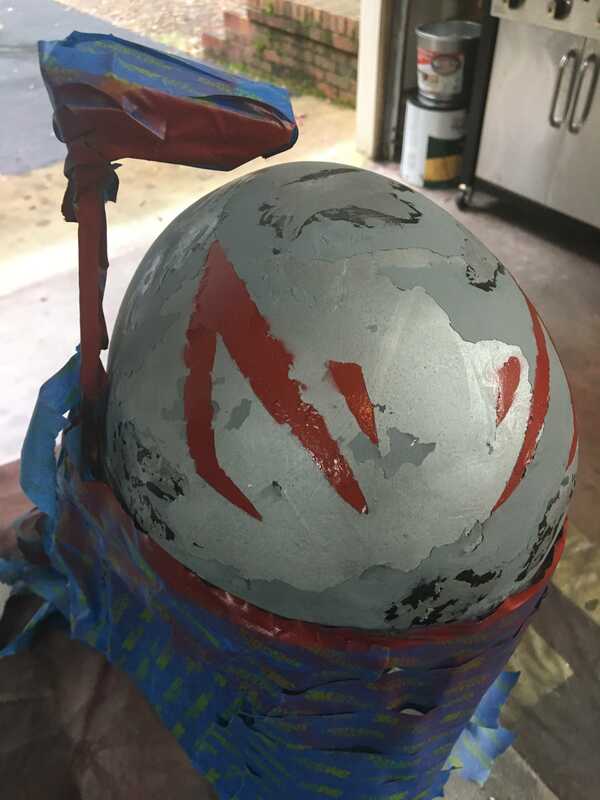 This only happened on the front of the helmet, so that's about a month's work thrown out in one go. Going to have to do a new layer of grey on the front, and I'm going to have to paint the jaig eyes freehand because I do not want to go through this AGAIN. *sighs* How's that saying go? If it was easy everyone would be doing it? If you could post some more details about the specific paints you're using -- brand, color name, etc. we might be able to troubelshoot the issue. Some paints just don't play nice together. Also if you could tell us more about your prep between layers, (sanding, washing etc) and the climate conditions where you're painting -- inside vs outside, humidity differences. All of those have an impact on what happens when you pull off the blue tape. Honestly..... i think you should bite the bullet and give it a thorough sanding down and then re-primer it. Ready to start again. That would probably be the best bet to make sure you don't have the issue again. 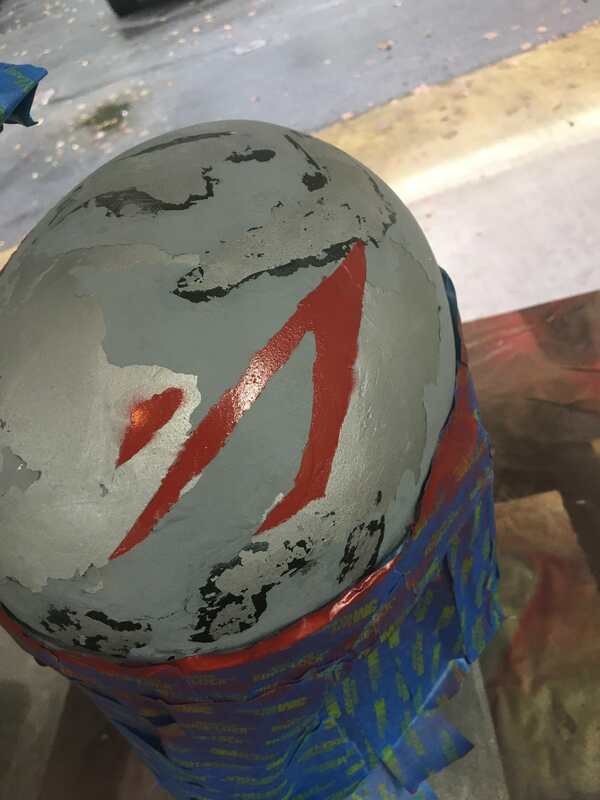 Keep to one brand of paints, use primer for primer, paint for paint.